“Secular Jewishness for Our Time” (The Forward Association, 2006) -- a three-part 346-page compilation of essays and articles on American secular Jewishness, co-edited by Dr. Barnett Zumoff (president of The Forward Association) and Karl D. Zukerman (former executive VP of the Hebrew Immigrant Aid Society). The release from Religion News Service notes that the book is split into three sections: 1938-40, 1968-69, and 1998-2000. The first two sections originally appeared in Kultur un Dertsiung -- the Workmen’s Circle monthly journal -- while the essays in the third section were solicited for the book and are being published for the first time. All Jews will coalesce around a central core of peoplehood and the elements of secular Jewishness: history, literature, traditions, the struggle for social and economic justice (tikkun olam), music, theater, languages, etc. It is to be hoped that this will lead to a sharp decrease in the heat and virulence of present-day internecine battles between various groups of Jews. There is a warm, comfortable, homey tent that is big enough to accommodate us all. When my grandmother used to hear people talk about getting something that was hard to get, she used to say: “That’s not something you find in the street.” That meant: “You’ll have to work hard before you can get it.” . . . .
One does not find a lifestyle in the street. It takes hundreds of years to develop. Our ancient Jewish lifestyle, thousands of years old, was built on religion. . . .
and white Jews go to Kol Nidre. so alone. Jews are still celebrating. and the streets will be peaceful and empty. In the synagogue it is a holiday, but the secular Jews are not in the synagogue, they are out in the street. And the street is empty. In 1947, communist forces were threatening Greece and Turkey, the reconstruction of Germany was faltering, mass starvation was setting in across Europe. In 1948, Czechoslovakia fell to communism; France and Italy appeared to be headed for the same fate, and Berlin was blockaded on the orders of Josef Stalin. In 1949, the Soviet Union exploded a nuclear weapon, giving our new enemy the ability to bring catastrophic destruction to our homeland. And weeks later, communist forces won their revolution in China, and claimed the world's most populous nation for communism. And in the summer of 1950, seven North Korean divisions poured across the border into South Korea, marking the start of the first direct military clash of the Cold War. All of this took place in just the first five years following World War II. The Cold War (which included hot wars in Korea and Vietnam and a nuclear confrontation over Cuba) lasted more than 50 years. But it ended in a victory so total and comprehensive that some thought history had ended. Within a week the front in France, behind which we had been accustomed to dwell through the hard years of the former war and the opening phase of this, was to be irretrievably broken. Within three weeks, the long-famed French Army was to collapse in rout and ruin, and our only British Army to be hurled into the sea with all its equipment lost. Within six weeks we were to find ourselves alone, almost disarmed, with triumphant Germany and Italy at our throats, with the whole of Europe open to Hitler’s power, and Japan glowering on the other side of the globe. The mighty German Army had surrendered unconditionally. Hitler had committed suicide. In addition to the immense captures by General Eisenhower, nearly three million German soldiers were taken prisoners in twenty-four hours by Field-Marshal Alexander in Italy and Field-Marshal Montgomery in Germany. . . . The contrast was certainly remarkable. The road across these five years was long, hard, and perilous. Those who perished upon it did not give their lives in vain. Those who marched forward to the end will always be proud to have trodden it with honor. Looking at history from a point of view many years after the story has ended, we tend to think of both World War II and the Cold War as conflicts with a single trajectory toward eventual victory. But history in real time is less clear -- a story of mistakes and miscalculations, unforeseen events and remarkable reversals -- and perseverance is easier to praise in hindsight than it is while history is actually occurring. But the lasting historical fact about the current war may eventually be not the discouraging circumstances of the day-to-day conflict, but the fact that America -- having saved the world from a thousand-year Nazi dictatorship and then an imperialistic Communist totalitarianism -- is engaged in bringing the beginnings of representative government to the heart of the Middle East as an alternative to Islamic fascism. If that effort succeeds, the result will be world-historical. This Memorial Day, one might think particularly of those of our fallen who also guarded polling places, opened schools and clinics, and excavated mass graves. They represent the highest form of the citizen, and every man and woman among them was a volunteer. This plain statement requires no further rhetoric. Ehud Olmert’s speech to Congress occasioned a beautiful essay by Ed Lasky regarding a prior occasion when the leader of a small embattled country, nearly alone and under barbaric attack, spoke from the same podium. Atlas Shrugged thought she was witnessing history. The speech had flashes of eloquence, moments of genuine emotion, and symbols of Jewish history looking on, with Holocaust survivor Elie Wiesel and the family of terrorist victim Daniel Cantor Wultz in the audience. For thousands of years, we Jews have been nourished and sustained by a yearning for our historic land. I, like many others, was raised with a deep conviction that the day would never come when we would have to relinquish parts of the land of our forefathers. I believed, and to this day still believe, in our people's eternal and historic right to this entire land. But I also believe that dreams alone will not quiet the guns that have fired unceasingly for nearly a hundred years. Dreams alone will not enable us to preserve a secure democratic Jewish state. Jews all around the world read in this week's Torah portion: "And you will dwell in your land safely and I will give you peace in the land, and there shall be no cause for fear neither shall the sword cross through the Promised Land". Painfully, we the people of Israel have learned to change our perspective. We have to compromise in the name of peace, to give up parts of our promised land in which every hill and valley is saturated with Jewish history and in which our heroes are buried. We have to relinquish part of our dream to leave room for the dream of others, so that all of us can enjoy a better future. (1) he has always believed, and believes “to this day,” that Jews have a “historic right” to the “entire land;” (2) but guns have been firing for 100 years; (3) the Torah declares that Jews have been given the Promised Land in peace; (4) but the people of Israel have “learned to change our perspective” and will give up part of that land -- a part “saturated with Jewish history” -- to people whose dream, spelled out in their charter, is the destruction of Israel. 4 then I will give your rains in their season, and the land shall yield her produce, and the trees of the field shall yield their fruit. 5 And your threshing shall reach unto the vintage, and the vintage shall reach unto the sowing time; and ye shall eat your bread until ye have enough, and dwell in your land safely. 6 And I will give peace in the land, and ye shall lie down, and none shall make you afraid; and I will cause evil beasts to cease out of the land, neither shall the sword go through your land. 8 And five of you shall chase a hundred, and a hundred of you shall chase ten thousand; and your enemies shall fall before you by the sword. 9 And I will have respect unto you, and make you fruitful, and multiply you; and will establish My covenant with you. It is Jewish history in a few words: a promise of land to be enjoyed in peace, a miraculous victory over enemies far greater in number, a covenant with God. But now, according to Olmert, the people of Israel have learned to change their perspective. They will uproot Jews from land saturated with Jewish history and turn it over to enemies who dream of a Judenrein world, who are arming themselves to realize their dream, and who have already demonstrated in Gaza what they plan to do with the land once they get it. And if they will not demonstrate that they will live in peace with Israel, Israel will uproot the Jews and give its enemies the land anyway. He is very, very tired. (Update: thank you to Lynn-B for the extraordinarily generous link). I wonder how many of Oprah’s viewers will misread this destruction [of European Jewry] as a proof of the Jewish people’s immutably tragic destiny. In the early pages of the book, Wiesel presents the Jews of his town as skilled in the practice of denial and avoidance, habits that seem to have blinded them to the Nazi program of mass murder. Rather than mounting a campaign of armed resistance or pursuing strategies of escape, they continue to trust in the underlying goodness and rationality of humanity. The suggestion seems unmistakable that an irrepressible aptitude for hope has historically bred a dysfunctional passivity. . . .
No doubt many readers, empathizing with Jewish suffering, will see a certain grandeur in the ability to endure and to survive a long history of affliction. But the role thereby assigned to God’s chosen people hardly meshes with the record of . . . Israel, which has successfully stood up to the onslaught of its Arab enemies in the conviction that only military might and political grit will secure its future. . . .
Today, in the querulous reactions of many European and American Christians to Israel’s unblinking refusal to submit to Arab terrorism, we have seen all too clearly the distorted moral priorities of a world prepared to welcome Jews only when they follow an ancient script, achieving tragic nobility through impotence and passivity . . . . Sooner or later, we will need to travel the road out of Auschwitz. 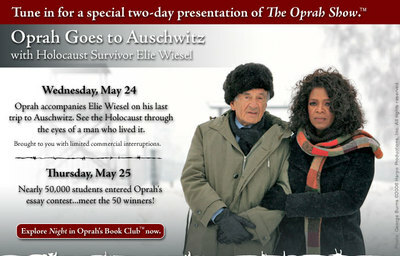 One can only hope that Oprah’s visit to Wiesel’s camp of ultimate horror will signal a beginning and not an end to that journey. KATHRYN JEAN LOPEZ: Which Christians in the U.S. are most Zionist and why? DAVID BROG: The evangelicals. No contest. Their Zionism comes directly from their theology. But, as opposed to what most people think, this theology is driven by the biblical promises of the Book of Genesis, not the biblical prophecies of the Book of Revelations. . . .
LOPEZ: How are Christian Zionists obsessed with the Holocaust? BROG: When it comes to the Holocaust, Christian Zionists remind me of Jews. The Holocaust is the point of reference, the great calamity against which all actions and threats are judged. Yet the obsession may even be greater among certain Christians because they feel guilty about the fact that people claiming to share their faith permitted this atrocity. Thus they seize every opportunity to stand up for the Jews and in so doing demonstrate how true Christians behave. A longing to make amends for the Holocaust often figures prominently in Christian Zionist speeches and fundraising literature. And the desire not to permit a second Holocaust drives their mounting alarm over Iran’s pursuit of nuclear weapons. No other community -- with the possible exception of the Jews themselves -- stresses the parallels between Hitler in the 1930s and Iran’s President Ahmadinejad today as do the evangelicals. . . .
LOPEZ: Whom do you want to read your book? BROG: I want Jews to read my book so that they will get over their fears of evangelicals and embrace our friends. I want Christians to read my book so that they will understand both the imperatives of supporting Israel and the wary reaction they will receive from the Jewish community. And I want people who are interested in politics and foreign policy to read my book so that they can better comprehend the birth pangs of what in time will be a very important alliance. Amos Oz spoke last Shabbat to more than 600 people, reading from his masterpiece, “A Tale of Love and Darkness” and answering a few questions. We had an iron rule that one should never buy anything imported, anything foreign, if it was possible to buy a locally-made equivalent. Still, when we went to Mr. Auster’s grocery shop, on the corner of Obadiah and Amos Streets, we had to choose between kibbutz cheese, made by the Jewish co-operative Tnuva, and Arab cheese: did Arab cheese from the nearby village, LIfta, count as home-made or imported produce? Tricky. True, the Arab cheese was just a little bit cheaper. But if you bought Arab cheese, weren’t you being a traitor to Zionism? Somewhere, in some kibbutz or moshav, in the Jezreel Valley or the hills of Galilee, an overworked pioneer girl was sitting, with tears in her eyes perhaps, packing this Hebrew cheese for us -- how could we turn our backs on her and buy alien cheese? Did we have the heart? On the other hand, if we boycotted the produce of our Arab neighbors, we would be deepening and perpetuating the hatred between our two peoples. And we would be partly responsible for any blood that was shed, heaven forbid. Surely the humble Arab fellah, a simple, honest tiller of the soil, whose soul was still undefiled by the miasma of town life, was nothing more nor less than the dusky brother of the simple, noble-hearted mujik in the stories of Tolstoy! Could we be so heartless as to turn our backs on his rustic cheese? Could we be so cruel as to punish him? What for? Because the deceitful British and the corrupt effendis had set him against us? No. This time we would definitely buy the cheese from the Arab village, which incidentally really did taste better than the Tnuva cheese, and cost a little less into the bargain. But still, on the third hand, what if the Arab cheese wasn’t too clean? Who knew what the dairies were like there? What if it turned out, too late, that their cheese was full of germs? Germs were one of our worst nightmares. They were like anti-Semitism: you never actually managed to set eyes on an anti-Semite or a germ, but you knew very well that they were lying in wait for you on every side, out of sight. Actually, it was not true that none of us had ever set eyes on a germ: I had. I used to stare for a long time very intently at a piece of old cheese, until I suddenly began to see thousands of tiny squirming things. Life gravity in Jerusalem, which was much stronger then than now, the germs too were much bigger and stronger. I saw them. A little argument used to break out among the customers in Mr. Auster’s grocery shop: to buy or not to buy Arab cheese? On the one hand, “charity begins at home,” so it was our duty to buy Tnuva cheese only; on the other hand, “one law shall there be for you and for the stranger in your midst,” so we should sometimes buy the cheese of our Arab neighbors, “for you were strangers in the land of Egypt.” And anyway, imagine the contempt with which Tolstoy would regard anyone who would buy one kind of cheese and not another simply because of a difference of religion, nationality or race! What of universal values? Humanism? The brotherhood of man? And yet, how pathetic, how weak, how petty-minded, to buy Arab cheese simply because it cost a couple of mils less, instead of cheese made by the pioneers, who worked their backs off for our benefit! The passage, like the book, is Amos Oz’s attempt to recapture an earlier time, one that is more consistent with his view of the Israeli-Palestinian conflict as a struggle between “right and right” or “wrong and wrong,” with both sides evenly split -- a time when even choosing cheese presented equally weighted moral choices, and all three hands were the same. But sixty years later -- fifty-eight years after the Palestinian Arabs rejected a state offered by the U.N. and attacked the other one, and five years after they responded to the Israeli offer of a state with a barbaric terrorist war -- the moral stakes are clearer, and less subject to ironic detachment. The Arab cheese has gone rancid, the anti-Semites are easier to spot, they number many more than thousands, and they are real. Convergence -- What Would Ariel Sharon Have Done? High-ranking officials from several government ministries have been covertly planning the legal framework of the convergence plan for several months, according to government sources in Jerusalem. The members of the interministerial team were appointed by the former prime minister Ariel Sharon about six months ago. Soccer Dad forwarded the article to me, with a suggestion that it indicated the “convergence” plan was what Sharon himself had been planning to do. Perhaps -- except the planning wasn’t a secret. And the article didn’t describe Sharon’s views. And we have pretty good evidence of what his views actually were. The best evidence of Sharon’s views is in a long article published in the January 23-30, 2006 issue of The New Yorker, about two weeks after Sharon’s massive January 4 stroke, written by Ari Shavit, the liberal columnist for Haaretz. The article was an extraordinary portrait of Sharon, based on six years of private conversations with him. Shavit began his conversations in 1999 (when Sharon was an old, out-of-power general, whose political career seemed finished) and spent the day of the stroke at Sharon’s ranch, talking to his sons, in preparation for his next private conversation that had just been scheduled for January 14. The article is as full a description of Sharon’s views as we have. Members of his inner circle have told me the details of the planning process. In the National Security Council, aides were working on four alternatives:  evacuating isolated settlements in the West Bank;  evacuating an entire settlement region, perhaps one near Nablus, where some of the most extreme zealots live;  withdrawing from eighty-eight percent of the West Bank; and, finally,  withdrawing from ninety-two percent of the West Bank. While this staff worked in secret, some in Sharon’s circle were considering the possibility of withdrawing to the border described by the security wall in return for American recognition of this lie as Israel’ permanent border. Others told me they also believed that by the end of the decade Israel would withdraw nearly to the fence line, making the Jordan Valley a security zone but not necessarily under Israeli sovereignty. Note that there are three groups in that paragraph: (1) “members of the inner circle” who disclosed the details of the planning process in the National Security Council (which consisted of work on four alternatives); (2) “some in Sharon’s circle” who were dreaming of a retreat to the security barrier as a “permanent” border recognized by America; and (3) “others” who believed in a withdrawal “nearly” to the fence line “by the end of the decade,” with retention of the Jordan Valley as a security zone. The first of the four alternatives under actual study at the time of Sharon's stroke was “evacuating isolated settlements.” The second was a variation of the first. The third and fourth appear to represent, respectively, Phase II (provisional state) and Phase III (final status) of the Road Map.
. . . Even in internal discussions, knowledgeable sources told me recently, [Sharon] refused to say where the border would be. He had reconciled himself to the establishment of a Palestinian state, but he demanded that it be disarmed and that it not control Israel’s water sources. He insisted, too, on a continued connection to Hebron and on control of the city of Jerusalem. Sharon believed, they said, that he could exploit the momentum of the disengagement process in order to compel the Palestinians to engage in a gradual diplomatic process that did not end with a “final” agreement. According to Sharon’s closest associates, the discussion of a withdrawal to the security wall displeased him. He truly opposed it. His operative plan was quite different: to negotiate an interim agreement with the Palestinians which called on the Israelis to evacuate approximately twenty isolated settlements. Shavit doesn’t disclose the identity of the “closest associates” who told him about Sharon’s “operative plan,” but it is worth remembering that he spent the day of the stroke with Sharon’s sons. The “operative plan” sounds a lot like the Road Map. Approximately “twenty isolated settlements” seems a reference to Phase I, which requires Israel to dismantle “settlement outposts” erected since March 2001. Sharon had already dismantled 25 long-standing settlements (not just post-3/01 “outposts”) in Gaza and Samaria. Dismantling 20 additional outposts was all anyone could reasonably require in Phase I, until the Palestinians met their own Phase I obligation to dismantle their terrorist infrastructure. The “interim agreement” sounds a lot like Phase II of the Road Map, which provided for the option of agreement on a Palestinian state with “provisional borders” and “attributes” of sovereignty, as a way station to final status negotiations in Phase III. The best evidence we have of Sharon’s views, from a respected Israeli journalist with extraordinary access to Sharon and his closest associates, thus suggests he planned to insist on the Road Map -- with its Phase I requirement of dismantling Palestinian terrorism prior to any large-scale Israeli withdrawal -- as the exclusive way forward, exactly as set forth in the April 14, 2004 exchange of letters with George W. Bush that was the crux of the Gaza disengagement deal. The cabinet is split over the question of negotiations. [Foreign Minister Tzipi] Livni and Justice Minister Haim Ramon prefer unilateralism, but Defense Minister Amir Peretz and Shimon Peres, minister of the development of the Negev and Galilee, want negotiations. Based on what we know, neither of these courses of action reflects what Ariel Sharon was planning to do. Peretz and Peres want to skip Phase I and II and go right to Phase III, as if we were back at Oslo. Livni and Ramon want to forego the Road Map altogether and simply give the Palestinians what they might have gotten in Phase III. It is hard to imagine which option Sharon would have opposed more. A month after his stroke, the Palestinians turned their government over to terrorists committed to destroying Israel. It is about as likely that Sharon would have responded by “negotiating,” or by handing them the West Bank, as it is that he would have appointed Amir Peretz as his Defense Minister. ERETZ-ISRAEL was the birthplace of the Jewish people. Here their spiritual, religious and political identity was shaped. Here they first attained to statehood, created cultural values of national and universal significance and gave to the world the eternal Book of Books. Impelled by this historic and traditional attachment, Jews strove in every successive generation to re-establish themselves in their ancient homeland. In recent decades they returned in their masses. Pioneers, ma'pilim and defenders, they made deserts bloom, revived the Hebrew language, built villages and towns, and created a thriving community controlling its own economy and culture, loving peace but knowing how to defend itself, bringing the blessings of progress to all the country's inhabitants, and aspiring towards independent nationhood. The catastrophe which recently befell the Jewish people -- the massacre of millions of Jews in Europe -- was another clear demonstration of the urgency of solving the problem of its homelessness by re-establishing in Eretz-Israel the Jewish State. . . .
WE DECLARE that, with effect from the moment of the termination of the [British] Mandate being tonight, the eve of Sabbath, the 6th Iyar, 5708 (15th May, 1948) . . . [there] shall be the Provisional Government of the Jewish State, to be called "Israel". On the eve of the establishment of the state, the Jewish yishuv in the Land was perhaps the most divided and fragmented of all the Jewish settlements in the world. In no other land could one find such a conglomeration of different ethnic groups, cultures, organizations and parties, beliefs and opinions, shifting ideologies and international orientations, conflicting economic and social interests, as in the yishuv -- as a result of the ingathering of the exiles, the center of all the divisions and splits in Israel. With the wondrous occurrence of . . . independence, it was as if all the divisions were overcome. 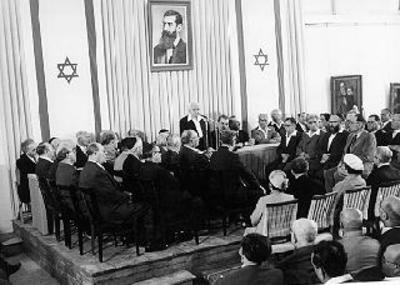 Representatives of all the parties in Israel signed the Declaration -- from the Communists, who had forever fought against the Zionist enterprise as reactionary, bourgeois, chauvinistic, and counter-revolutionary, to Agudat Yisrael, which had perceived as apostasy any attempt to bring about the redemption of Israel through natural means . . . However, it was not only these two extremes that . . . overcame their prolonged and bitter opposition to the state of Israel. The representatives of Shomer Hatzair, who for over twenty years had maintained that a binational state was the only means to realize the Zionist goal . . . participated in the signing. . . .
And representatives of the Revisionists, who had vehemently fought against a state based on partition, also signed the Declaration. The only obstacle . . . was the last paragraph [of the Declaration] referring to “trust in the Rock of Israel.” Some radical intellectuals considered those words an apostasy against atheism; on the other side were ultra-Orthodox extremists who perceived the failure to add “and its Redeemer” . . . as an apostasy against fundamental dogma. Nevertheless, everyone signed after negotiations. And not only the parties in Israel but the Jewish people throughout the world were united on that day in their joy and pride over the establishment of the state. It is difficult to assess which of the two miracles was greater -- the miracle of independence or the miracle of unity. Like America, Israel has not yet reached all its goals. But its story and aspirations are the hope of history. It is the alternative to the chaos that surrounds it. And both countries will need to re-establish their internal unity in order to survive. Messages were passed to the White House through several channels, Jewish activists said. And it seems to have worked: Speaking before the annual conference of the American Jewish Committee in Washington last week — his most recent address before a Jewish audience — President Bush talked about America's commitment to prevent Iran from obtaining a nuclear weapon and about his administration's commitment to Israeli security, but he did not link the two, as he has several times in recent months. "We are basically telling the president: We appreciate it, we welcome it. But, hey, because there is this debate on Iraq, where people are trying to put the blame on us, maybe you shouldn't say it that often or that loud," said Abraham Foxman, national director of the Anti-Defamation League. "Within the Jewish community there is a real sense of 'thank you but no thank you.'" . . .
And what is the cause of Jewish sensitivity to public American support for a U.S. ally and U.N. member under threat of extinction from an Islamic fascist nation? Jewish objections to the president's rhetoric have increased in recent weeks, as the storm created by a recent paper by two academics criticizing the influence of the "Israel Lobby" continues to grow. . .
You call this a Lobby? One morning 10 years ago I awoke with a savage headache that rendered me unbalanced and nauseated. My 6-year-old son came in to see why I wasn't up getting him ready for school. He took one look at the situation; his mother in bed, sweaty and lifeless as the guy in cartoons with X's where his eyes should be; and took charge of the situation. . . .
"You go back to sleep. I can get myself ready." He brought me a glass of orange juice, petted me, like little children do, and made sounds of sorrow. . . . When I next woke, with a half hour left until we had to leave for school, I called out for an update. "Everything's going great, Mom." "Have you gotten dressed, honey?" So I went back to sleep with a wistful and amazed sense of our being partners in this business. Soon he would hardly need me at all. After nearly half an hour more of sleep, I bolted out of bed, my headache gone, pulled on clothes and raced out to gather him up for school. There he sat, on the couch, with a root beer in one hand, the TV remote in the other, wearing his Power Rangers underpants, beaming. It is worth reading, not only for the graceful writing and gentle humor, but for the religious vision of empathy, humility and love, visible by the end of the story in a young boy’s matted hair. Walt & Mearsheimer have responded to some of their critics in a long reply published in the latest issue of the London Review of Books. In their reply, they acknowledge not a single error in their paper. Instead, they have repeated and compounded their factual mistakes. So, unfortunately, here we go again. In his formal response on the Harvard website, Dershowitz wrote that their description was “demonstrably false,” citing both Dennis Ross’s extensive account of Camp David and Ehud Barak’s 2002 interview in which he called the Bantustan accusation “one of the most embarrassing lies” Arafat told about Camp David. I’ve previously shown that Walt & Mearsheimer took the Barak quote egregiously out of context and that they completely ignored Ross’s day-by-day account of Camp David. Now Walt & Mearsheimer seek to rebut first person accounts of Camp David by the top U.S. and Israeli negotiators by asserting there are “a number of competing accounts” and that “many” of them allegedly support their point. Put aside the question of how many “many” of “a number” is, or who wrote the allegedly contrary accounts; the more important point is there are no eyewitness accounts of Camp David that support Walt & Mearsheimer’s assertion. On the contrary, every one that has been published to date contradicts it -- especially including the one by Shlomo Ben-Ami. In an extensive interview published in Haaretz in 2002 (which Walt & Mearsheimer have likewise ignored), Ben-Ami called the Bantustan allegation “ridiculous” and noted that Hosni Mubarak had concurred. While no map was presented during the final rounds at Camp David, this map illustrates the parameters of what President Clinton proposed and Arafat rejected: Palestinian control over 91% of the West Bank in continguous territory and an Israeli security presence along 15% of the border with Jordan. This map actually understates the final Camp David proposal because it does not depict the additional territorial sway of 1% that was offered from Israeli territory. Both Ross and Ben-Ami also published maps in their books illustrating the December 2000 “Clinton Parameters” that were accepted by Israel and then rejected by Arafat in a face-to-face meeting in the Oval Office: 100% of Gaza, 95% of the West Bank, and an additional 1-3% land swap from within Israel (for a total of 96-98%), including a safe passage between Gaza and the West Bank, with the entire area “clean of Jewish settlements” (in Ben-Ami’s phrase). Though never abandoning wider territorial dreams, it would not have occurred to Ben-Gurion to delay the establishment of the Jewish state because he would not have access to the Western Wall or the Temple Mount. The positive ethos of building a new society was supposed to compensate for the poverty of the territorial solution. . . . The Palestinian national movement has been more about vindication and justice than about finding a solution. It therefore never possessed the capacity to make a positive decision. . . . The Palestinians have consistently fought for the solutions of yesterday, those they had rejected a generation or two earlier. This persistent attempt to turn back the clock of history lies at the root of many of the misfortunes that have befallen the peoples of the region. The West Bank “replete with settlements” consists of 250,000 Jews wishing to live in their historic homeland of Judea and Samaria -- a number that is a very small percentage of the total population there. The Palestinian national movement has never explained why one million Arabs can live safely in Israel but not a single Jew can live in a putative Palestinian state. But the answer seems obvious: the Palestinians have a higher priority -- a much higher priority -- than simply a state on contiguous territory. The Palestinians’ priorities have repeatedly prevented them from accepting a contiguous state, even when it has been formally offered multiple times. To explain their latest decision, they resorted to a big lie about “Bantustans.” It is a position refuted by every first-person account of Camp David, but one that still lives in the hearts of “scholars” unable to read primary sources. See also Ivan Koridornih’s “Florscheimer und Walt” at the Middle East Discussion Board.